How accurate are test strips and what affects results? That is perhaps the most asked question by millions of diabetics every day. When I wanted to know, I tested three times with three meters over three locations. My ranges were from 120 to 156. As a nerd, I wanted to know why. Here is what I discovered. First let me very clear. I am a Type 2 diabetic. I have no experience with type 1 or the issues associated with type 1 diabetes and therefor I make no claim that my opinions have any value to anyone with type 1 diabetes. I have taken great steps to verify all the information contained within this article. If there are any errors, please contact me. When I started researching this topic I found research papers from all over the world. I buried myself in graphs, research papers and independent studies. After a night of brain pain I thought, was I over thinking the issue? Of course I was over thinking the issue, I am a Nerd. So before you read this information, I am going to give you my conclusion first, just in case you don't make it to the finish line. With proper use I think glucose meters are, for the most part, accurate enough for you to effectively manage your type 2 diabetes. Now for the Nerdy stuff. The modern glucose test strip generates a small electrical current when compounds on the strip come in contact with glucose. 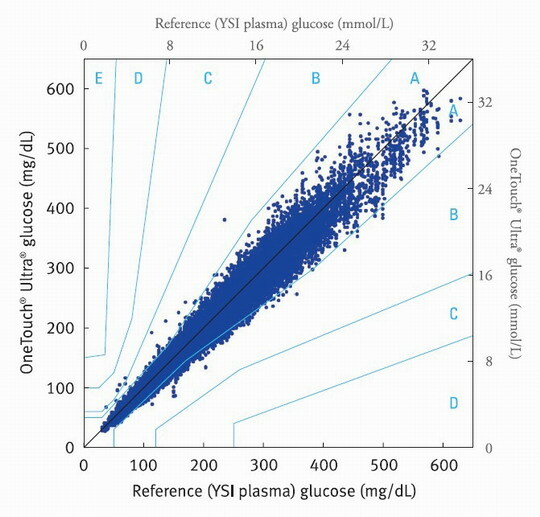 The more glucose in the blood sample, the larger the biochemical reaction. A meter is basically a volt or current meter, albeit a very sensitive one. Test strip are manufactured by screen printing or vapor deposition of electrodes and the application of necessary reagents. These reagents are what react in the presence of glucose, the meter measures voltage or amperage output and relates that to a glucose level. Here is the link to the research paper I read on that subject. Electrochemical Glucose Biosensors by Joseph Wang (opens new window). How are glucose meters and strips tested? Home Glucose Testing Systems are rated by comparing samples of blood to the results of a laboratory quality device, usually a YSI model. 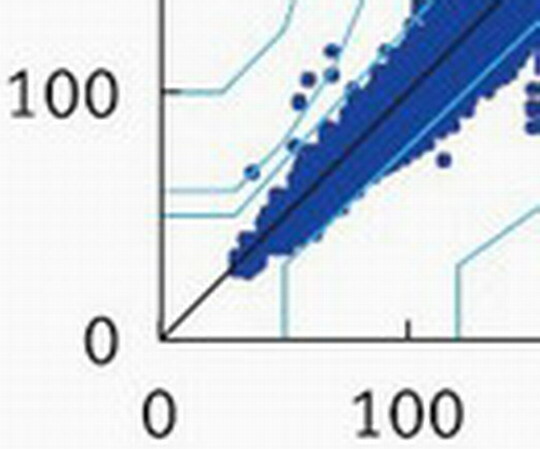 The results are applied to an error correction grid which illustrate the variation of the home meter to the lab device. The industry standard error grid has been the Clarke Error Grid, however the newer Parkes Error Grid, a more stringent error grid, seems to be the new bench mark.. Each grid establishes zones. The vertical axis is the home meters result and the horizontal axis is the lab device results. Where these two results intersect is represented by a dot. Each dot falls into a zone. Each zone represents what consequences exist based on the accuracy of the home meter. There are two Parkes Correction Grid, one for type 1 and another for type 2 diabetics. Zone Definitions for the Clarke Error Correction Grid. Zone B contains points that are outside of 20% but would not lead to inappropriate treatment. Zone C are those points leading to unnecessary treatment. Zone D are those points indicating a potentially dangerous failure to detect hypoglycemia or hyperglycemia. Zone E are those points that would confuse treatment of hypoglycemia for hyperglycemia and vice-versa. Zone A - Represents no effect on clinical action. Zone B - Represents altered clinical action with little or no effect on clinical outcome. Zone C - Represents altered clinical action—likely to affect clinical outcome. Zone D - Represents altered clinical action—could have significant medical risk. Zone E - Represents altered clinical action—could have dangerous consequences. A reading that plots to the upper and left of the center line represents a reading that measured lower than the lab reading. Obviously all manufacturers strive for 100 percent accuracy all the time, but I don't think that is feasible at a price point consumers (or insurance companies) are willing to accept. As you can see in the close up, there is a small chance that at random reading will not inform a diabetic they are at an unsafe low level. I suggest you ask your doctor if you are concerned this might happen to you. What affects the accuracy of a test strip? First, If you are questioning your test strips accuracy, let me ask you this. Are following you ALL the directions printed for your meter and test stripse? Lets summarize all the basic. Keep your test strip bottle closed when not in use. These are some of the basics, but make sure you follow all the recommendations in the manual for both your meter and test strips. OK? Beyond all the basics, the one factor that does not seem to be covered well is how long are test strips usable after you open the bottle? Is the first strip as accurate as the last strip even though the last strip is well inside the expiration date. The short answer is, not always. The compounds on the test strips which react with glucose also react with oxygen. My Endocrinologist informed me that he found one of the more accurate test strips on the market only provided those accurate results for a week. A WEEK!! are you kidding me? You have to test 7 times a day to go through a 50ct bottle in a week. For some diabetics I guess that is OK, but I don't think everyone test 7 times a day. I am not sure what the average is, but shouldn't we know that information? I would bet you that all those error correction test are done with freshly opened bottles. Not ones that have been opened 20 times with fingers poking around inside the bottle or having test strips fall out and put back in. I want to know THOSE test results. 1. Joan L Parkes, PHD. ; Stephen L Slatin, PHD. ; Scott Pardo, PHD. ; Barry H Ginsberg, MD, PHD. 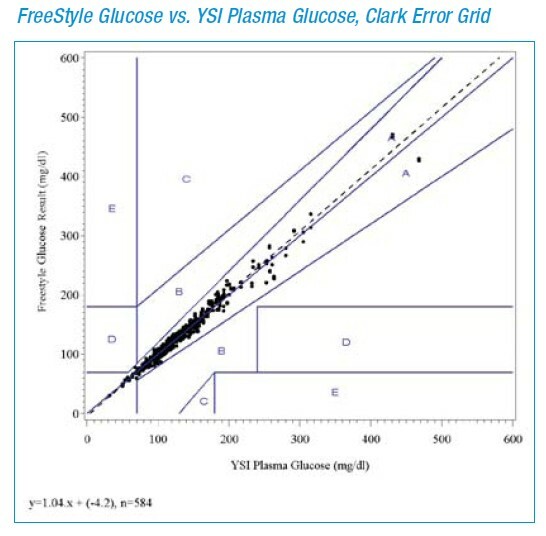 A New Consensus Error Grid to Evaluate the Clinical Significance of Inaccuracies in the Measurement of Blood Glucose. Diabetes Care. 23(8):1143-1148, 2000. 3.OneTouch® Ultra® Brand Test Strips: Meter equivalence and proven accuracy. 2006. My regular readers know that I consider agave to be a BIG enemy to health and beauty- which is very high in fructose (up to 97% fructose). It truly irks me that sly marketing makes the general public think agave is a “healthy” sweetener, and that it continues to be used in “health” products purported to be better than regular baked or other goods, as well as in many restaurants. It is not.